J-Lat improves patellar tracking in cases of lateral patella subluxation and dislocation. Pro-Tec Athletics' J-Lat Knee Support helps guide the patella back into proper alignment with gentle pressure from the lateral to medial direction. Compression surrounding the patella will help keep it in the patella-femoral groove. The J-Lat provides lateral tracking control by means of two elastic straps. 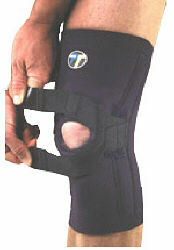 These straps stretch over J shaped tubing and help guide patella into its proper femoral groove.